What, exactly, is 5G for? Why do we need it? How will we use it? And how is it going to improve our lives? As usual with new tech, 5G is part-sales pitch, part-revelation, and part-stab in the dark. The Olympics will play a huge part; when Pyongchang 2018 and Tokyo 2020 roll around, the world will see what 5G looks like as super-fast Wi-Fi hits trains, and even enables real-time AR and VR streaming. Eventually it will super-charge home broadband and enable real-time 8K video calling apps. The connected world is about to get super-charged. However, it’s at ‘5G’ smartphones where we should start. The so-called 5G handsets unveiled in Barcelona are actually the most unconvincing piece of the jigsaw. The tag-line is that ‘5G’ phones will be able to download a movie in seconds, access cloud storage instantly, and stream 4K video. OK, that’s pretty cool, but few of us will pay extra for that. The most interesting thing about the Sony Xperia XZ Premium is that it introduces a 4K HDR display, and takes video at 960 frames per second, both of which suggest that we could all be wanting to stream in much higher quality. Cue the need for more bandwidth. 5G will also help more of the world get online by increasing the total capacity of the global telecoms network; don't forget that people are still coming online for the first time. 5G enables that growth. How fast will 5G be, and when will we get it? Sony's Xperia XZ Premium includes Qualcomm’s Snapdragon 835 chip, that technically allows download speeds of up to 1 Gbps. That's nothing. Sahala admits that 5G networks, when they do come after 2020, will be implemented slowly, so coverage will be patchy for a few years. The European Commission has said it wants one city in each EU country to have a 5G network by 2020. However, Sahala also says that Nokia has successfully shown 5G network speeds in trials that reaches 30gbps. Why on Earth would we need those kind of bitrates? Easy – 5G is for mobile AR & VR, and in ever-increasing resolutions. “5G will enable AR and VR, but they won’t just sit in the home, they’re going to be mobile,” says Chris Rice, SVP for AT&T's Domain 2.0 Architecture and Design. AR and VR are set to advance dramatically, and are major drivers for 5G networks. At MWC 2017, Intel was showing 8K VR multi-player gaming transmitted from the Nokia booth half a kilometre away, via an Ericsson base station. “We know video is going to be a big part of the future, and live 8K video, whether it’s VR or not, is going to be a ‘Jetson’s moment’ where you have this almost FaceTime-like experience, but in high quality and in real-time,” says Julie Coppernoll, VP, Marketing, Intel. “We didn’t define and build 5G for the phone, we defined it for the self-driving car, and for live VR,” he adds. As Coppernoll suggests, there is no way autonomous cars can exist without 5G. This is a story not about bandwidth, but about latency – the speed of an exchange of data between car, cloud, and back to car. Or from car to car. Or from car to traffic lights to car. All of it has to happen lightning-quick if it's to work at all. Remember how Tokyo 2020 will usher-in 8K video? Well, the forthcoming Winter Olympics – PyeongChang 2018 – will do the same for 5G. We know this because SK Telecom insists it has created the first 5G network (already in trials) and will be the first to use it. The evidence is on a SK Telecom booth at MWC 2017 where it’s showing a miniature village of PyeongChang 2018 all decked-out in 5G. 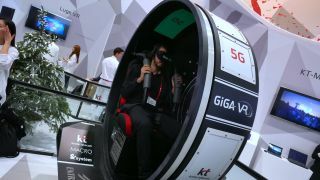 It’s promising that we’ll be able to stream all kinds of 5G-enabled VR experiences from PyeongChang, and demoing on the booth is Luge VR, where anyone can experience the famously dangerous ice-tunnel Olympic sport in VR. Live. In 4K. By Tokyo 2020, that will have changed to live 8K VR streaming. However, watching live TV on phones in higher quality, and more reliably while travelling, is itself a big reason for 5G. Or Fixed Wireless Access, to be precise. Samsung network's 5G radio – showing behind closed-doors at MWC 2017 – beams-in to homes (with a 5G receiver in the window … they’re still working out the physical sweet-spots) at up to 10 gbps, though in the demo on Samsung Networks’ booth, it was managing 4.1 gbps. No cables required; this is about aping fibre-optic broadband, wirelessly. Nokia is planning the same thing using its Nokia FIRST system and an Intel 5G modem. It could be a game-changer for anyone living outside urban areas where fibre-optic infrastructure won’t ever be cost-effective to install. This is often described as 5G’s ‘Holy Grail’ moment. When did you last get a fast, reliable WiFi connection on a train, or bus? Probably never. Ditto for a (hands-free) phone call while driving on a highway or motorway that didn’t splutter or cut-out? 4G is not good at transitions between cells, with audible blips as the signal swaps from one cell tower to the next as you travel. 5G changes that. 5G is about making the pipe bigger and more flexible, not just faster. So next time you wonder what all the hype is about 5G, remember; it’s not all about you and your phone. It’s about 4K, 8K, AR, VR and much more – it’s about everyone and everything going online everywhere and in constantly higher quality.